acquisto levitra Senza Ricetta: Comprare Levitra Generico online in Italia. Comprare Levitra Generico senza ricetta ad un prezzo basso. go here At 40-meters, Ocean Pure is a privately owned, five cabin phinisi for enjoying a convivial lifestyle on the water. The bohemian chic interiors create the ambiance of a designer home for exploring the breadth and depths of Indonesia’s vast archipelago. 5 htp drug interactions adderall and viagra Completing a full refit in 2017, Ocean Pure reflects the dream and joie de vivre of her French owners. Enjoy the good life on Ocean Pure without sacrificing the comforts of home. Entertain friends and family over long meals on the bow, sailing through the islands, exploring, diving and enjoying life at its finest. enter site Ocean Pure’s five cabins feature a fresh, stylish decor lovingly designed by the vessel’s owners. Each cabin is appointed with impeccable taste and sensibility combining Indonesian artifacts with a palette of whites and blues. The sumptuous master cabin on the upper deck features an expansive private balcony, while four equally exquisite guest cabins on the lower deck each feature private en suites. All cabins feature air-conditioners and pressurized hot water systems. Ocean Pure’s interior and exterior lounge areas offer plenty of space for relaxing and enjoying the pleasures of company, cuisine and soaking up gorgeous scenery as it passes by. The main saloon’s doors open to create an expansive space for socializing stretching out to the deck. 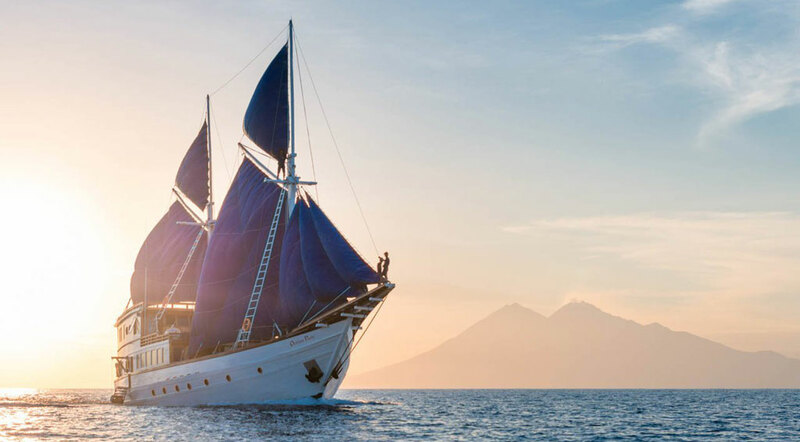 Ocean Pure’s cruising grounds between Bali, Komodo and Raja Ampat offer charter clients opportunities for adventurous inland excursions coupled with some of the best diving the world has to offer. Cruise the islands in style and relaxed comfort on Ocean Pure. View the famed Komodo dragons in their natural habitat on a guided tour, and delve into Indonesia’s most bio diverse marine worlds for dazzling underwater explorations – all with the comforts of home onboard. Ocean Pure was originally designed by a professional commercial diver to accommodate the most avid sport dive enthusiasts. Other water sport activities include kayaking, paddle boarding, snorkeling, and swimming in white sand-rimmed bays, alongside plentiful beach combing and island trekking opportunities.